Although most cats like to hide in boxes, they seem to have a built in aversion to cat carriers. This is probably because carriers are usually associated with a trip to the vet! So, if you get anxious even thinking about getting your cat into a carrier, try these hints. First, try to remain as calm as you can. Many cat owners have had the experience of thinking about a trip to the vet one second, and the next second the cat is nowhere to be found! Not surprising, as animals pick up on our emotions. They’ll know something is up or your feeling stressed —and try to get away from it and you. Remember to breathe. Get the carrier out well before you’ll need your cat to be comfortable in one. Leave the door open and a blanket or towel with their scent on it inside, and maybe a toy, too. Don’t make a big deal about this, just set it up and walk away. Your cat will most likely check it out on his own, and may even hang out inside for awhile, making the space more familiar, and less of a threat. Make sure the carrier is clean and free of debris and smells from the last trip — cats are keen to these things. Top loading crates like this one offered by Sleepypod are a cat owners dream come true. They are circular in shape which is exactly how cats sleep, curled up in a ball. It’s lined with soft padding and the top sips on and off and there’s a slit in the middle that zips open as well. There’s also a way to attach it to your seat belt in the car so that your carrier won’t slide around while you’re driving. It’s got a thick padded shoulder strap. They have really thought of everything. Once I got one of these, I’ll never go back to the old kind of crate/carrier again. They are a little more expensive than a cheap plastic crate but once you try one, you’ll be glad you got it. That’s just my personal opinion and I don’t get paid to say that. It’s just my honest opinion. 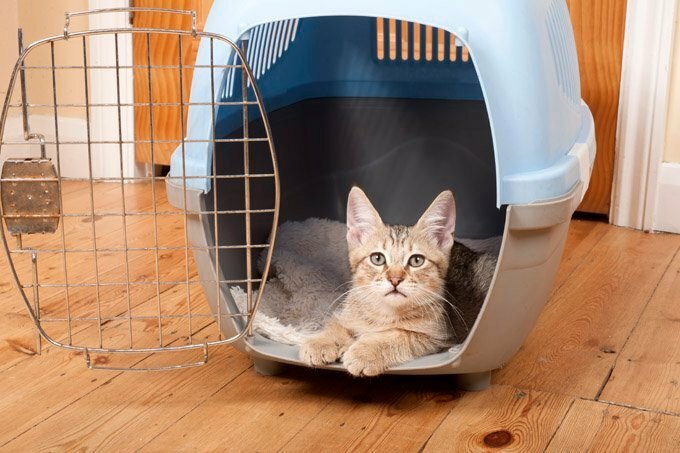 There are a couple of ways to get your cat inside the carrier; head first, and hip first. For head first, place one hand around the shoulders and the other along the hip on the opposite side. Gently guide the cat inside, clear the tail from the door, then close the door quickly without slamming it. If this doesn’t work and your cat is resisting, tip the carrier up on its end with the door open. Pick up your cat as you do normally, and while supporting his chest with one hand, gently guide his hips down into the carrier. Lower the rest of his body down, then close the door and latch it. Lower the carrier to the floor slowly to allow the cat to get his feet under him so he doesn’t end up on his back or side. Some carriers have top openings too, but these usually require practice or a second pair of hands. Always reassure your cat after getting him inside. You may even reward him with a treat, though he probably won’t eat it. It’s the thought that counts! For a very wiggly cat, try wrapping a towel around his back and crossing the ends around his chest – the way you wrap yourself in a blanket when you’re cold. Once inside the carrier, he’ll slip out of the towel and you can remove it and close the door.